If you know me, you know how much I love Paula Deen's recipes. I guess it's because I'm all about comfort food, which is very similar to southern cooking. So, when I heard about Trisha Yearwood's new southern cooking show, I knew I wanted to check it out. This is a recipe that she made on the first episode I saw. While she was cooking with her sister and her niece, she told the story of how her Father had wanted a certain cake that his mother had often made, but no one knew the recipe. Years later, they found a box of recipes and this was among them. As soon as he saw the recipe, he said "That's the cake!!" And now it's become a staple in their family once again. Pretty cool, huh? I just love stories like that. That's sort of one of the reasons I started this blog. It's a great way to archive my family's recipes, and hopefully they'll be passed down for generations. Anyway....now we need to talk about the cake itself... It's crazy insanely good, but OMG.....Holy go off your diet, Batman! This cake seriously gives Miss Paula a run for her money! So, just remember to save this one for a special occasion, ok? But DEFINITELY try it! It's amazingly good! Grease and flour a 9-inch tube cake pan. Cream the butter and sugar until light and smooth. Add the eggs and vanilla extract, beating well. Mix in the vanilla wafer crumbs, coconut and pecans. Pour into the pan and bake for 1 hour and 15 minutes. Allow the cake to cool in the pan for 10 minutes before turning out onto a rack. Mix the sugar, cornstarch, salt, lemon zest and juice, 1 1/2 cups of water and coconut in a medium saucepan. Cook over medium heat, stirring until thickened, for about 15 minutes. 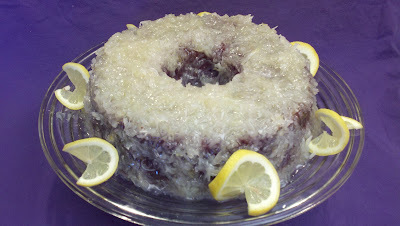 Let cool slightly, then using a toothpick, poke several holes in the top of the cake and drizzle the glaze over the cake. Instead of greasing and flouring, I just use a nonstick baking spray. It has flour right in the spray, so it takes care of both the greasing and flouring at the same time. Very convenient! I used a tube pan, just as the recipe directs, but I think a Bundt pan would make the cake look a little nicer when it's flipped over....Then again, Jerry says that's what ALL of my cakes look like. So not true! Anyway, I was also thinking of using a 9x13 pan, just because that would lend itself to pouring the glaze on top and letting it sink into the cake, as opposed to running down the sides, don't you think? I think next time I may leave the lemon out of it, and just make it a coconut cake. Actually, Chris said he doesn't even think the cake needs to be glazed at all. Well, you decide!